The Templar Rose and Bright Morning Star - floresdelcaminos Webseite! During the first five days of the retreat, on site at 'Flores Del Camino', we will explore the symbolism and geometry of sacred buildings along the pilgrimage route to Santiago; the octagonal churches of Eunate and Torres del Rio, the magnificent Ucero, as well as Wells cathedral in England. Part of this exploration will consider the Fibbonacci ratios 8:5 and 13:8, which are related to the Marian symbolism of the rose and the Morning Star. Our explorations will be continued in the final two days by visiting the related sacred sites along the pilgrimage Way to Santiago. 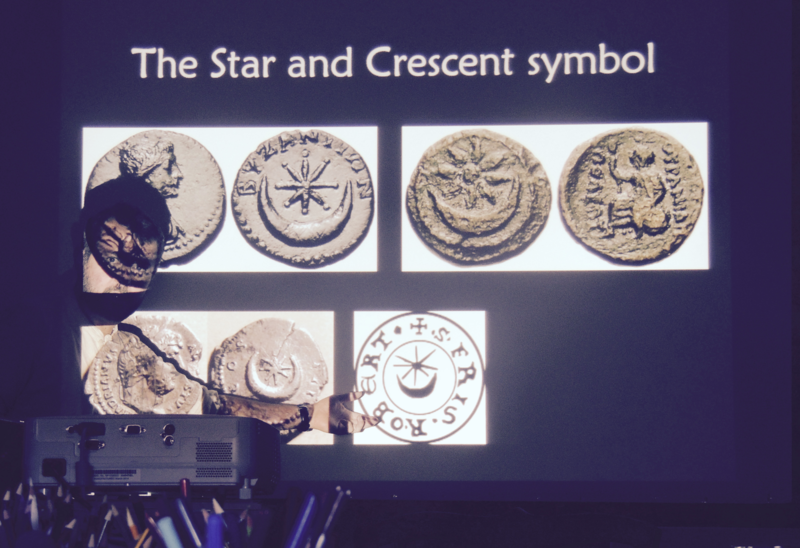 The "Morning Star" is the epithet used for both the Risen Christ as well as for the Virgin Mary. In cosmological terms, the Morning Star is the planet Venus because she rises just before the sunrise and then, as the "Evening Star" she sets just after the sunset. The symbolism of Venus has also long been associated with the rose and this appears to be related to the cosmological phenomenon known as the Venus Penteagram: the orbital interactions of planets Earth and Venus plot out the coordinates of a pentagram star over the course of an eight - year cycle. Such five - fold symmetry emulates the five petals on a wild rose and the five mystery beads on a rosary. The rising of Venus in the east is also symbolic of the Risen Christ on Easter Sunday, who rises up from His journey through the underworld that He entered on Good Friday. This part of the Easter story also naturally reflects the ancient cosmological myth of Innana - (Sumerian pre Venus) . After she sets in the west as the evening star, she journeys down into the underworld and experienced death there for three days and three nights. She is reborn as the morning star in the east and ascends back up to her heavenly origin. In this retreat we will focus on the influence of this ancient cosmological symbolism on medieval Christian culture, including the symbolism of the rose in the chivalric tradition of Courtly Love, and in churches in the Camino region that are associated with the Knights Templar. We will also consider the same cosmological symbolism in the design of Wells Cathedral - the first English gothic cathedral - with its pentagonal Lady Chapel dedicated to the Virgin Mary, and situated at the cathedral's east end. The original rose window of Santiago cathedral appears to depict the eight - year cosmological cycle or Earth, Venus, Sun and Moon. We shall explore the window's geometric design and its cosmological symbolism. The Camino de Santiago itself is a symbolic journey of death and resurrection in that it leads westwards towards the setting sun and the evening star. After the journey westwards is complete, the pilgrim is reborn into a new existence and walks home eastwards towards the rising of the bright Morning Star. 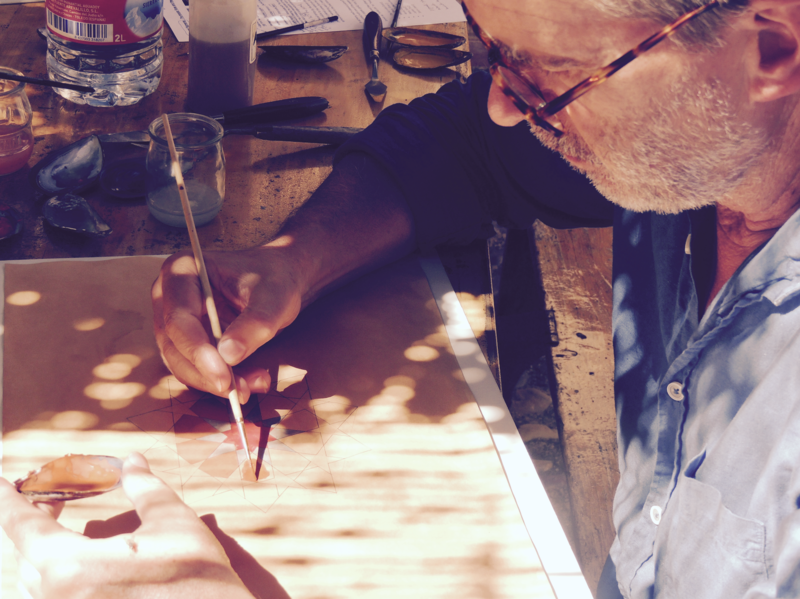 These explorations will enable us to create some beautiful geometries on tea - stained paper, using natural pigments. During the retreat we will be nurturing the traditional "pilgrims communitas." You will be enjoying home cooked meals under the pergola in the courtyard shaded by vine and fruit trees and sharing by the fire in the evenings under the star - lit Milky Way. 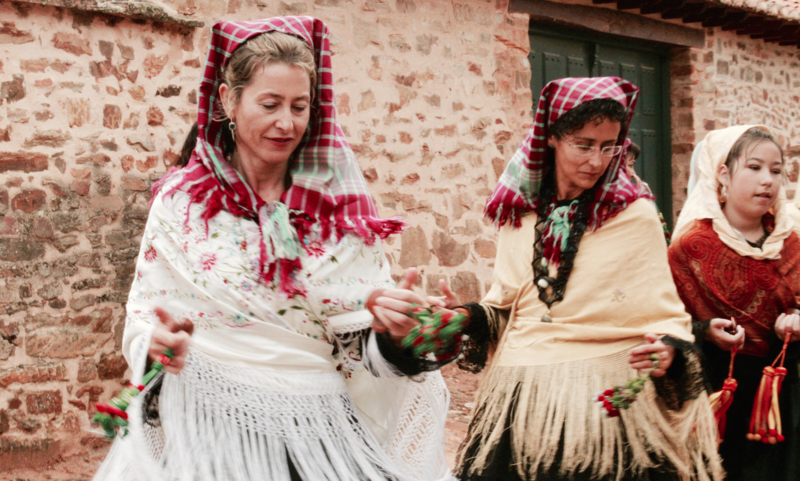 At the start of the retreat, you will have the special opportunity to experience the annual "La Magdalena " festivities, which will include processions, traditional Maragato dress and dances. This festival is dedicated to the patron saint of the village Mary Magdalene. 27th Arrival (we welcome guests from 4pm) evening meal welcome 7 pm. 3rd Morning visits to Eunate and Ucero. 5pm drop - off at Madrid airport / Madrid. Tom Bree is a geometer - artist, teacher and writer. 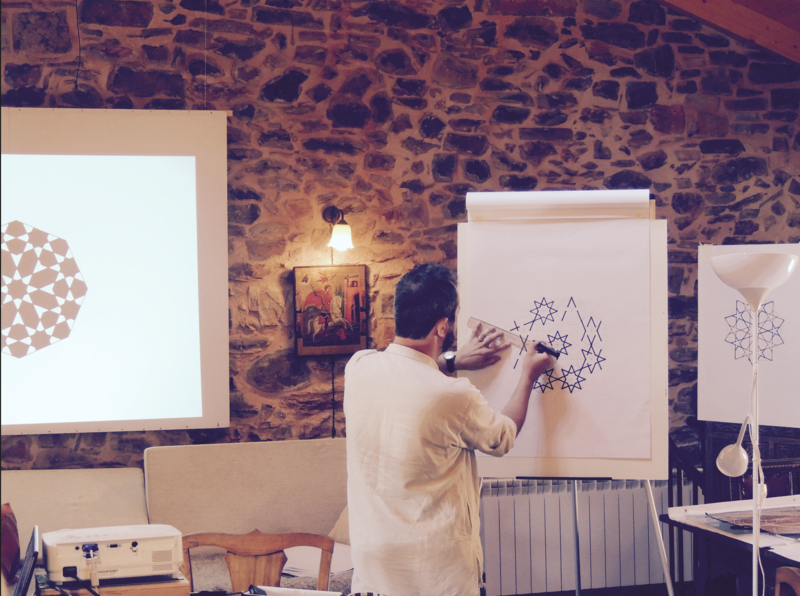 He specialises in the use of geometry in sacred art and philosophy and teaches drawing art classes as a form of contemplative philosophy. 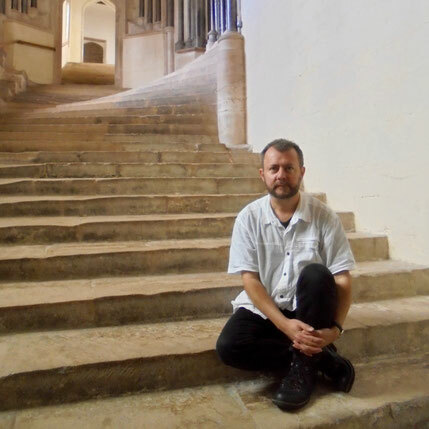 Tom teaches primarily at the Prince's School of Traditional Arts in London but also for various other organisations both in the Uk and abroad including the Princes Teaching Institute, The Chalice Well in Glastonbury, the RWA in Bristol and the Education Renaissance Trust. For the last 9 years Tom has been conducting a very detailed geometric analysis of the design of Wells Cathedral in Somerset he is soon to publish. See ABOUT for Bertrand and Basia's backgrounds. Once we confirm a place is still available, you can secure it by making a 300 euros, non refundable deposit. The remaining amount is to be paid two months before the retreat. Refunds are only available if all spaces are filled or you can find a replacement for yourself. You can make the payment via Pay Pal to bg@floresdelcamino.com. Contact us should you prefer a different method via bank card (via phone payment - + 34 691 221 058 ), transfer or Transferwise. Please note to make sure you cover all transaction or conversion fees.